My work has evolved from living on the northern coast of California. I paint into the colors and forms that emerge and how they connect to the elements: earth, air, fire and water. ENCAUSTIC has become an inspirational medium for me for the past 8 years in expressing nature, the rocks, skies, ocean, and landscapes. Beeswax, oil paint and a torch are my tools. I love fusing the color I brush on with wax to create layers of transparencies. I experiment with various papers on wood. The process brings me to abstract from the natural architecture of the land and sea. I studied at the San Francisco Art Institute and received an M.F.A. from U.C.L.A. in 1972. There, Richard Diebenkorn worked with me as a professor of art and I was influenced by his bold abstract work. I also studied at the San Francisco art Institute working with J. De Feo, a well-known abstract expressionist. 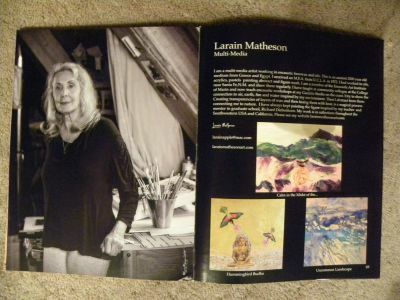 Presently, my work has evolved and I continue to exhibit at galleries and art centers in California, Colorado and the Encaustic Art Museum in Santa Fe, and the Conrad Miles Gallery in Tucson, Az. 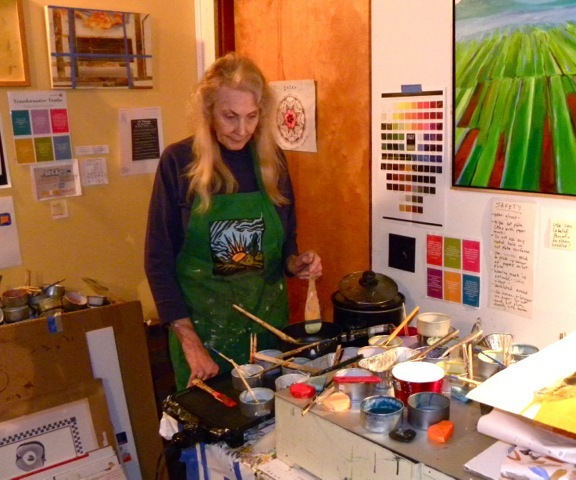 I presently teach encaustic workshops at my ocean home studio in Gualala,Ca. I have lived in Mexico and the Southwest, and worked with native people. Their unique colors and environment have influenced my work. I have won awards in the Bay Area at juried shows, and at the Mendocino Art Center Juried Members Show in January 2013, and at the Kensington Invitational in the Bay Area. I exhibit at the Berkeley Art Center, O’Hanlon Center for the Arts in Mill Valley, and regularly at the Gualala art Center, Discovery Gallery, and the Dolphin Gallery in Gualala,Ca. My journey is to create new works that expand my senses of place, opening up new spaces to fill with color, making the unseen more “visible”.